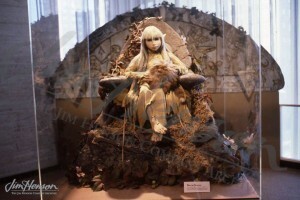 With the footage for The Dark Crystal in the can, attention turned to all the spectacular craftsmanship that went into the production. 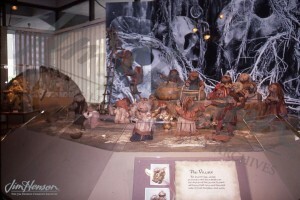 There were hundreds of props, costumes and extraordinary puppets that made up the world of The Dark Crystal, and creating an exhibit where fans could marvel at their artistry seemed like an obvious thing to do. There was so much to show, in fact, that two exhibits were created. 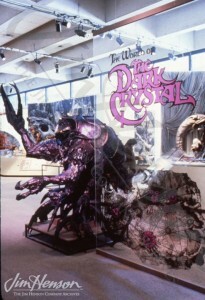 In New York, for the Performing Arts Library at Lincoln Center, the exhibit was called “The World of The Dark Crystal” and, according to the press kit, it gave the public, “…its first look at the fantastic creatures of The Dark Crystal and their environment, in tableaux using the actual sketches and drawings, as well as set pieces, artifacts, furnishings, costumes and symbols, all of which [were] used in the film.” In Los Angeles, at the Craft and Folk Art Museum, the exhibit, which opened several weeks later, was called “The Art of The Dark Crystal” and concentrated on, “…the exceptional craft artistry – fabrics, household utensils, weapons, work tools and the like – of the civilization created [for the film],” along with creatures. The “World of The Dark Crystal” exhibit toured internationally to England, Japan and Australia. In France, the displays were handled differently. 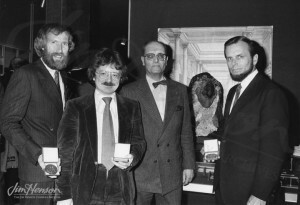 Items from the film were exhibited as part of the “Exposition de Cristaux Geants”, a natural history show featuring giant crystals at Paris’s Jardin des Plantes. Interspersed among the amazing gems were images and actual Skeksis, Gelflings, Mystics and other representatives of the species populating The Dark Crystal. At the opening event in Paris in 1983, Jim, Brian Froud, and producer Gary Kurtz celebrated having won the grand prize at the Fantasy Film Festival in Avoriaz, France. 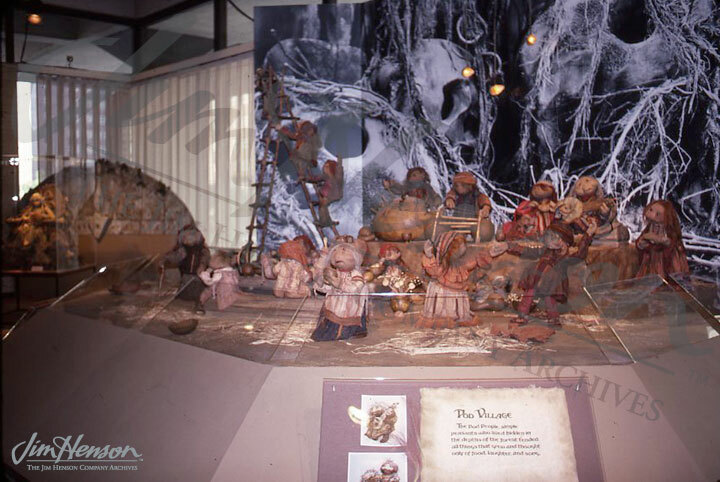 Displays in “The World of The Dark Crystal” exhibit, 1982. 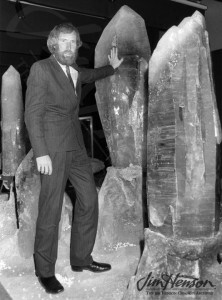 Jim with real giant crystals in Paris, 1983. This entry was posted in 09-September '82, 1982, Dark Crystal, Exhibits and tagged Australia, Brian Froud, Craft and Folk Art Museum, England, Gary Kurtz, Japan, Performing Arts Library at Lincoln Center, Washington D.C.. Bookmark the permalink.